If, like me, you were a bit 'different' at school, you'll know the loneliness of being the last one picked, the shame of people talking about you unkindly or the horror of being bullied and excluded from the 'popular' group of kids. It isn't pleasant for the most resilient of us and it can leave the more vulnerable children broken inside - and worse. No one wants their child to be one of those kids. And none of us, presumably, wants their child to be the one doing the excluding and bullying either - and you may not even know it if they are. 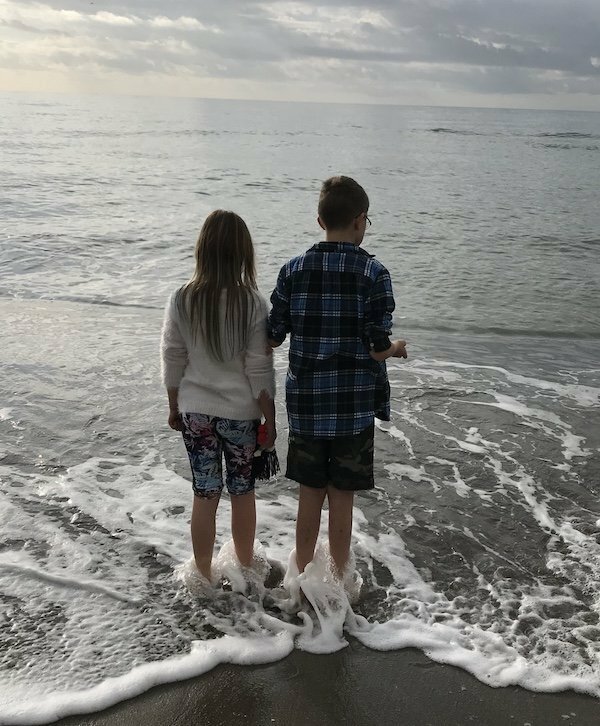 But we can take steps to impress upon our children what we know to be true - that kindness, tolerance and to accept one another whatever their difference - is a basic requirement of humanity. One mum, Helen Eaton, knows this only too well. Helen is mum to three children, one of whom has a diagnosis of autism. She also delivers autism workshops and training. Today on SNJ she shares a very personal story about her son, who just wants a friendship to call his own. My son doesn’t just want a friend; he wants to be a friend. On his behalf, I wish I could tell the children he knows and meets the following wonderful things about him. He will be a good and loyal friend, be interested in you and your life, be polite in your house and play nicely with your siblings. He’d love to share his online Minecraft worlds with you, his plans for building a spy den for superheroes and his life goal of generally tackling the villains of the world. He’ll send you friendly text messages at the weekends to check how you’re doing. He’ll share the sweets he’s hoarded and hidden from his brother and sister; bring his favourite things to school for you to see and even let you borrow them. He picks up the rules to complex board games really well and would love to show you how to play too. He knows how to charm adults, particularly ladies of a certain maturity, who describe him as delightful and lovely, which leads to extra treats and attention and a good degree of leniency in many things. He knows where the fun stuff is, and although never actually in the middle of the trouble, always knows where to find just a little bit of mischief. He loves rock music and can drum, with an unusual sense of rhythm and timing. He would make you symmetrical line drawings, and can freehand cut a piece of paper into your initials, a tree or a mask. He can see solutions to problems and detail in patterns many others would miss. He can do a few magic tricks, tell jokes and clown about. He is awesome at playing physical games, loves rough and tumble activities and could show you some amazing Kung Fu moves. If you’re stuck or scared he’ll help you climb that tree or get down that drop-slide and congratulate you afterwards. He’ll be proud of your successes and accepting of your difficulties. Why is my son rejected by other children? Today he is crying in his bed because in his second term of secondary school he can’t find a friend. Lots of children have decided that he is different from them and that his differences are not acceptable. Lots of children declare that they don’t like him and don’t want to be his friend. When I look at him I try and see what other people see and try to figure out why they reject him. I see a beautiful face, strong even features, and wide amber brown eyes with eyebrows that wriggle in wonderful ways. I’ll admit his hair is fairly boring at the moment, just sort of sitting limply on his head. He used to have a bit of a Mohican that he’d gel up, but he prefers his hair plain right now. He’s a simple jeans and t-shirt kind of guy. He has the occasional tic which means he may roll his shoulders up and back a few times, or gulp and cough a little noisily. He may fiddle with things around him, bits of plastic or paper, and he often has a great collection of screws, shells, or interesting stones in his pockets. He worries about everyday stuff and can get a bit panicky when things don’t make sense. He sometimes needs a little more patience when explaining things, and you have to be quite clear in what you’re saying, not overloading him with lots of information or instructions as that makes his thoughts whirr and spin. He can be quiet in groups as, although he understands everything that’s going on, finding the right words quickly enough can be tricky, so he just listens. He is autistic and dyslexic. Those things are not immediately obvious as he doesn’t wear a badge with those labels and they don’t cause people to come out in a rash when they stand too close. Both things simply mean his brain works differently to the majority, but it also works in ways that are really important for the world in terms of ingenuity, creativity and design. He needs some additional support in school as with all the noise and distractions he struggles to focus, and spelling and writing are tricky. He’s a really bright boy and understands and knows far more than most people realise. He’ll happily tell you what makes things a bit easier for him and how you can help. He can be a bit stressy at times and look panicked and confused. That’s because some children do more than just avoid him, or exclude him from their games and groups. Some boys and girls seek him out as a target to humiliate and hurt. He’s often alone, there are no other children nearby willing to say leave my friend alone. He stands out as a solitary figure and some children abuse him. Yesterday, like several other days this term, he came home smeared in mud. He was walking a classmate to the school bus stop, because he said that’s what friends do for each other, when he was grabbed, a hand clamped over his mouth, then dragged to the ground and through the dirt. As the term has progressed, he isn’t as jolly and smiling at break times as he used to be. Perhaps because during the morning he was yet again beckoned over by someone he thinks is a friend, only to be called stupid and weird, so that other boys nearby were impressed by this show of dominance and humiliation. Perhaps he was shoved into a wall again and is now struggling to make it to the end of the school day, desperate to be home and safe. Those kinds of things may well make him reluctant to join in with groups at break time, and hang back from playground games, and it becomes a vicious cycle he doesn’t have the skills or knowledge to break. When he is frightened in class his cannot learn what is being taught and he cannot participate. His education is being restricted by the other children sitting around him. With a look to his future, I know that children with poor school attainment are more likely to end up homeless or in prison. Those that are bullied and isolated are more likely to have mental health issues and attempt suicide. I have fought for 11 years to provide the best opportunities for my son in an era of low funded, poorly managed and inadequately equipped SEN services. It terrifies me that the actions of other children may trigger such devastating consequences for him. My son’s school offers a great safe space at break and lunch times, learning support, a nurture group, an amazingly warm and caring SEN advocate and lots of clubs and activities to engage kids throughout the day. There is a strong anti-bullying policy, but staff can’t be everywhere and see everything. Bullying is often dealt with once the incident has happened, the bully identified and ultimately the damage done. My son cannot and should not have to hide from other children. I should not have to witness his sense of impotence, rejection and isolation which can’t help but to lead to his anger, sadness and tears at home. 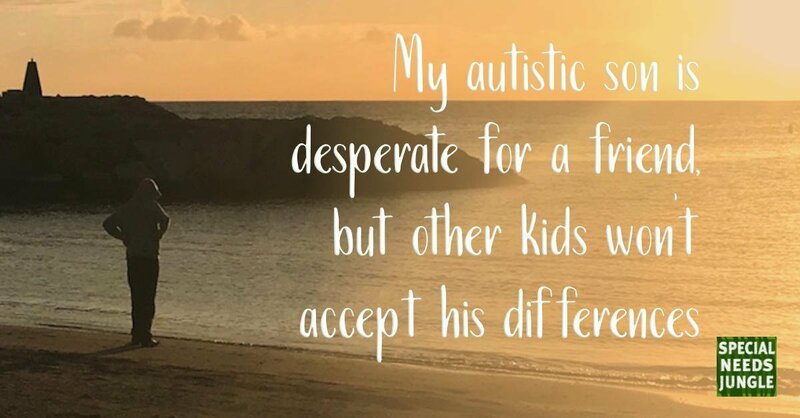 I don’t want your children to feel sorry for my son, or be a token friend. I want them to be broad-minded, accepting and kind. I don’t have to work hard to like and love my son – it’s easy because he’s amazing and I’m open and accepting of his difficulties and strengths. So I now turn to my fellow parents and ask you to think about your own child. As I speak of bullies, abusers and those that simply ignore my son please don’t automatically cast your mind to those you think of as bad parents, difficult families or the known troublemakers. Stop and think about your child. What values and beliefs you have instilled in your child? What social media sources are they using, and where is the pressure coming from to conform and so reject those that have a little spark of something different? What language are you casually using at home about people who like or do things you don’t know or understand? Are you making negative judgments about friends, families or celebrities? Are you without realising it shaping your child’s intolerance? Are you narrowing their view of friendship? Do you ask them to try and develop new friendships; to actively involve other children in their games and groups? Are you aware that they may be actively or accidentally identifying and humiliating those who behave or learn differently to them? As a parent I can be the first to admit that my own three children are not perfect. I could list a thousand silly, daft and deliberately aggravating things they’ve done over the years. What I have done is to actively ensure they’re not intimidating, threatening and excluding other children. I’m not naïve, so I watch and listen when they talk about how they treat other people, and I question and deal with anything that concerns me. I try to teach and demonstrate resilience, acceptance and kindness. We do lots of stuff together; we travel, try new activities and have adventures. Over the years life has thrown many unexpected and distressing things at us. Sometimes we make mistakes and sometimes people hurt us, but each time we pick ourselves up and we move on positively. My children are tough and know how to bounce back from challenging situations. All three could easily be described as naturally quirky, and so they need this resilience in part to protect themselves from other children’s spite and ignorance. I’m incredibly proud that they are growing up to be tolerant and accepting of others. I know this because they have brought a wide of variety of children home as friends, even ones that have hurt them in the past and with whom they have worked it out and moved on. Some of their friends might be called challenging or have difficult home lives. Those things don’t worry us; the children just get on and have fun. It’s ironic that teachers often pair my kids up with the ‘naughty kid’ in class because they know they’ll happily accept and even calm that child down. So I ask every adult reading this to really encourage the children in your lives to be tolerant of anyone that seems to look or do things differently. Tolerance shouldn’t take much effort; it quickly becomes acceptance and then the norm. It just takes a little mind shift to get started. The rewards of friendship, new opportunities and broadened horizons are worth the effort. My son is very much worth the effort. How to use the law to fight local SEND cuts: ACT NOW!